The annual MSXDev home brew development challenge for the MSX range of computers has been going from strength to strength since it start in 2003. MSX Classic – For first generation MSX 1 machines only with at least 32k of Ram. This year there have been 15 full entries submitted for judging. All can be freely downloaded to try out either using an emulator or on real hardware. After an initial of assessment by a panel of judges the finalists will be put to a public vote to select the winner. A platform puzzle game, along the lines of Kings Valley but with a unique theme. Entered in the MSX Classic section, and written by CARAMBALAN Studios. “This game gives you the experience what it’s like to be a member of a weird, masochistic sect. Make your wishes come true by burning yourself in the altar. Avoid the snakes, kill them if you need to, and navigate your way in the dungeons to find the lighter and the gasoline. The next entry is an action game that features swordplay. Here, we take on the role of the Buddha while travelling through 6 realms: Hell, Hunger, Animals, Asuras, Humans, Gods and Nirvana. In each realm we will encounter enemies like Birth, Aging, Sickness, Death and Karma and, at the end, a big boss we will have to defeat. The next entry is quite a nice run and shoot game, where you have to rescue survivors while avoiding and shooting the Zombies. Entered in the MSX Classic section, and written by Pentacour. Next we have a graphical adventure, with quite an unusual story. Entered in the MSX Classic section and written by José Soto Gándara. Showing what the MSX standard could have become had it continued to advance, we have our 1st MSX Freestyle category entry. Written for MSX 1 and above, but with a V9990 graphics card and a MSX-Music compatible card. Dreams Puzzle follows the classic mechanics of sliding puzzles but in this case the pictures look awesome thanks to the artwork made by Josephine Wall who granted her kind permission to use it in this game. Dreams Puzzle uses the screen mode B3/512 x 424/ 16bpp and 32768 colors and features music by MSX chiptune veteran Meits. A back port of a popular mobile platform puzzle game, is the next MSX Classic entry and written by Wim Dewijngaert. Linez is a game based on Numberlink logic puzzles. Here, you have to connect faces of the same colours and avoid to make them cross trails with each other. Next we have a fun top down racing game, entered into the MSX Classic category and written by Uninteresting. Here we have a multiplayer game for up to 4 players at the same time! Why play alone if you can have even more fun with three friends instead? Our next entry is a classic text adventure built using a port of the Graphical Adventure Creator, entered in the MSX Classic category and written by Timmy. While exploring the countryside, you find a sign. Are you able to find treasure here? Our next entry is entered in the MSX Freestyle category, requires MSX 2 or greater hardware and written by Nobuaki Washio, GW’s-Workshop. 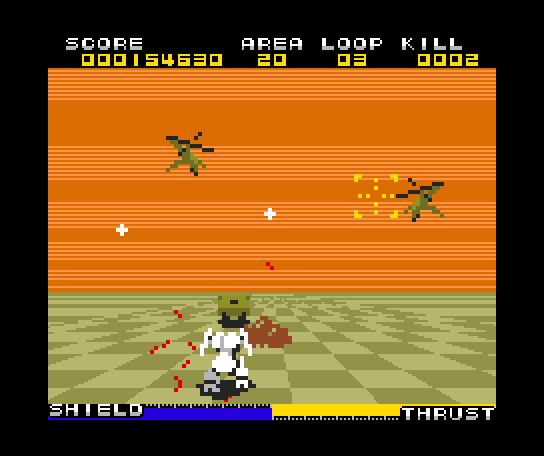 Shoulder Blade OVERDRIVE is a very fast arcade where you control a mech destroying all the enemies approaching you. The scrolling effect is very engaging as it makes you feel the high speed action. An original game where we control a spaceship which has no attacking capabilities. As we travel along space, there will be annoying lasers chasing us all over the screen, while enemy bullets approach our ship as well while we can not fire any projectiles ourselves. But, how can this be? Well, the only hope to survive is using our ship power to generate a gravity field around itself in order to pass through the lasers but at the same time we are like a magnet for enemy bullets. We’ll have to find the balance between avoiding lasers and allowing the bullets to approach us… This will not be easy. We have to master this gravity field in order to reach the highest record. Next we have an entry in the MSX Freestyle category, that supports a range of hardware addons but with a minimum of a MSX 2 machine, written by the talented team Bitvision Software. Accept the challenge to a gory duel against your opponent and try to survive! The last entry in the MSX Classic category, is fun top down racing game, written by Brain Games. Race in different kind of tracks and championships as you climb the ranks to become an authentic champion. To reach the top you must manage your budget, carefully choosing the best options on each case. Try to be the best driver but also pay attention to the advices from your agent. And don’t forget to drive fast but safe! A sequel to a MSXDev entry in 2008, this MSX Classic entry looks to be a wonderful puzzle game with lots of challenge, written by Metal Soft. The snake returns, ten years ago, its quite familiar mechanics are here again to twist our minds. This time around, though, apart from eating flowers, our snake is able to pass through certain walls by picking up yellow exclamation marks. Also, arrows limit our movement as we can only pass over them in the designated direction. It’s probably clear by now that it’s wise to plan your path carefully, because the mazes available are a little bit tricky. The next entry in the MSX Classic category is another excellent puzzle game, with very nice colourful graphics, written by Ilkke & bitsofbas. Think fast, there’s no time to waste! Move the pieces quickly or you lose a life. Can you beat the High score? A soccer simulator written in Basic, uses more than 32k so has ended up in the MSX Freestyle category. Written by G.G.G. Soft in 1990, but previously unreleased. Welcome to the world of soccer! This is Goal, a management simulator where you must prove that you can be a true manager of your favourite team. Choose wisely where and how to spend your budget in order to win the League. If you waste your money you will not be able to pay the inscription fee for the championship, which will get you fired!